These positive reviews some up the Junk King experience. Every session is taken care of by at least two very capable movers. This is a very friendly team that is going to be doing all the hard work for you. It doesn’t matter how heavy something is or how bulky it might be. The focus for Junk King is always about getting rid of your stuff in a timely manner. As for the pricing, Junk King charges a flat rate based upon how much room on the truck your stuff will take up. This is an estimate that will be presented before the work begins. If it turns out that your stuff takes up less room than what was estimated, you’re still be paying that original fee. The last part of Junk King’s service happens long after they’ve left your home. That is how they dispose of all the things you want to get rid of. They won’t be driving straight to a landfill. Instead, they will be making drop-offs at charities and recycling centers. That’s great news for the local environment. 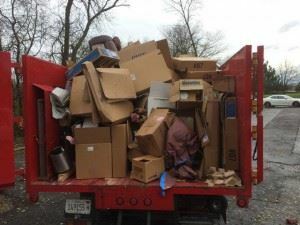 You’ll be ready to add your positive review after hiring Junk King Contra Costa to haul away your rubbish. This entry was posted in Contra Costa Junk Removal and tagged Junk King, junk removal, reviews on September 30, 2017 by Junk King. Last updated October 1, 2017 .